This article will describe a real life example of a manual application of BI360. The excitement for Dynamics 365 Business Central is growing, and organizations will need a CPM tool to achieve Reporting and Budgeting that enables world-class decision-making. For those that know me, it has been well known that I despise soccer. I have never enjoyed watching it or playing it. When my son Evan first started playing sports, I told him he can only play soccer until he turns 7, and he promptly quit to concentrate on other sports. So, there was much amusement from my friends and family when I was asked to help coach my daughter’s 6-year old soccer team. I explained that I don’t know soccer and I don’t like the sport, but my daughter Ella was so excited, so I said yes. I have always believed that sports teach kids about life, such as playing as a team, being competitive, being a good sport, and trying your hardest. With that, there are many learning experiences for me as well and how it parallels everyday work. BI360’s budgeting module is very easy to use, and provides your organization with a powerful budgeting and forecasting tool. With BI360 Budgeting, you can reduce your budgeting and forecasting times, as well as your implementation and software costs. The intuitive, Excel-based interface of BI360’s budgeting module allows you to quickly adapt a budget model based on your existing budget templates; or you can completely re-engineer your process and input form layout based on your organization’s changing requirements. There are also a number of pre-defined templates you can use if it makes sense for your environment. In this video, you’ll see how sample BI360 input templates provide the flexibility and customization your organization needs for budgeting initiatives such as departmental expenses, balance sheet, cash flow, payroll, and revenues, and more. 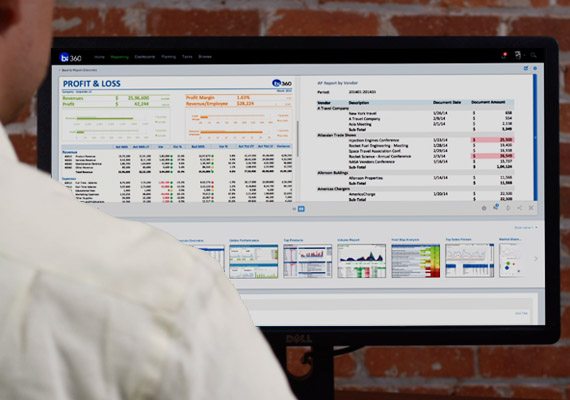 From predictive analytics to allocations to advanced workflows with multi-step approvals, BI360 budgeting is a proven planning engine that delivers the performance and ease-of-use that your organization needs to drive efficiency and execution with state-of-the-art short- and long term planning. BI360 not only supports all departmental budgets, but supports revenue details, capital expenses, employee budgets and more. With BI360, budgeting and reporting processes become tightly integrated and easily accessed, all within a modern Microsoft Excel add-in for dynamic input forms and reports and with a SQL Server database on the back-end. Plus, with BI360’s highly customizable capabilities, budgeting administrators can set upcentralized workflow with “social” collaboration features so that contributors and approvers can easily communicate objectives, comment and propose changes, saving valuable time and resources in your budgeting process. By controlling the entire workflow process, BI360 facilitates a smoother, more efficient budgeting process across your entire organization. Be sure to watch our video to see how BI360 can save your company significant time and money in your budgeting process. Watch now. Finance and IT: Can’t We All Just Get Along? Celtics vs. Lakers. Mac vs. PC. Stallone vs. Schwarzenegger. There’s nothing like a good rivalry, but when it comes to the long-term health of your business, it’s usually better to NOT have one department declaring war on another. Such has been the outcome with most BI projects, when determining who should drive the project between Finance and IT. It’s easy to see why there has always been a clash of priorities between the two. Finance wants to access and analyze their data, how, when, and where they want it. But finance professionals haven’t always been the most tech-savvy group, which has only increase their dependence on the IT side of the fence. From the IT side, any new BI tool can’t just be plugged into the enterprise systems and magically turned into a high-performance, user-friendly solution. Each project has to be vetted, tested, and built for specific organizational needs. It takes time. It takes valuable resources away from other projects. And in larger organizations, it can take an army to move these projects across the goal line. Solver’s BI360 helps Finance and IT not merely to coexist, but to align their BI objectives and thrive. It’s an incredibly user-friendly, self-service business intelligence suite that can meet and exceed the demands of any complex, multi-departmental organization. And while it may not be as entertaining as a Tyson vs. Holyfield fight, it can certainly help your organization become more productive (and positive) with its next BI project. Learn more. The customer may always be right, but are they profitable to your company? While losing a customer (especially in our current economic climate) is never ideal, they may be costing your company more than a holiday gift basket. There are a number of ways to determine if doing business with a customer is profitable for your company, and to ensure that you’re managing your customers effectively. As we’ve discussed in recent posts, BI360 Reporting can analyze your profitability using various allocation methods. Specific to customer profitability, you can factor in outlying variables such as ongoing support cost, handling of special requests, average billing rates (services) or sale price (products) and other key customer-related information. BI360 works across customer segments and industries such as healthcare, financial, retail, and manufacturing, to help organizations identify customer relationships that are profitable, and conversely, those that aren’t. See how BI360 provides better insight to help understand your customers on a more profitable level. Week 2 in our profitability series highlights project profitability, and how a tool like BI360, with a strong allocation engine, can provide insight into your projects the same way it does with your products. BI360 can just as easily build a profitability report using the same allocation model we demonstrated last week (i.e. salaries, headcount, square footage, direct expenses). However, for organizations (like a consulting firm) that may not have a product per se, square footage may not be as applicable. Maybe it’s time dedicated to each project, billable vs. non-billable… however you need to track and measure your projects, BI360’s customizable reporting tool allows you to generate accurate, insightful reports. Plus, with BI360 you can allocate revenues and expenses from the GL department/account level and out to project codes, thereby enabling the creation of project P&Ls or other detailed project reports, helping your organization further identify and resolve issues within any given project. Here’s a video that explains how BI360 provides better insight into your profitability. Hi everyone, over the next few weeks we’ll be exploring a three-part profitability reporting series. This week, we’re looking at how to gain insight into your product profitability, and how BI360 can help you become more competitive by generating more accurate profitability analysis. Salaries per product: How much are you paying your employees to work on certain products? By capturing the percentage of time each manager spends working on each product or brand, you can understand the impact of salaries related to your products. Headcount per product: Are specialty products utilizing too much of your staffing resources? It’s critical to understand who’s working on which product and adjust your headcount accordingly. Square footage per product: How much of your commercial space is allocated to each product? By leveraging data stored in your GL statistical account, or by directly entering data into the model, you can see your cost of doing business by the square foot. Direct expenses per product: How much should be allocated towards expenses like marketing, consulting, contracted services, etc.? Both the allocated expenses and the actual expenses need to be accurately accounted for. Of course, your company will use its own allocation model, and with BI360’s 3rd generation reporting tool, you can generate all the allocations needed to support your ordinary company/department reporting with P&L’s at the product or product group level that gives you better insight your products and your profitability. Below is a video that further highlights these points. Recently, Solver was a sponsor at the WennSoft User Conference where we received great feedback on BI360’s integration with WennSoft, as well as a number of other 3rd party Dynamics GP ERP ISVs. BI360 offers both LIVE reporting and reporting through the BI360 data warehouse. In the case of WennSoft, Solver has created an out-of-the box integration and it is part of the LIVE Dynamics GP reporting offered with BI360. This provides Wennsoft customers with immediate value from BI360’s reporting and dashboard modules, which both utilize the same, live integration to GP. Solver has pre-defined the integration with the WennSoft Job Cost and Time Sheet modules (see screenshot from the BI360 Report Designer below). Additional fields and tables can be added from the BI360 Integration Customization tool or the BI360 Meta Data tool. From time to time, Solver will also add new out-of-the-box integration touch points based on customer demand. We have written a white paper on the many additional reporting capabilities offered by BI360’s integration with WennSoft, feel free to download it here.